When I was a kid, I remember hearing this fantastical tale about neighborliness. You know the one I mean. About knocking on their door and asking to borrow a cup of sugar? I was always sure this kind of thing could never happen in the modern world. Until I met a fantastic young mom who lives down the block from me. She went grocery shopping for me after Jake was born. We take our kids on walks together. And…we totally raid each other’s kitchens. She borrows a lemon, I borrow 7 cups of flour (yeah, yeah…); she buys farro to serve her family at my suggestion, she promptly gives the rest of the dry farro to me after her family rejects it…you know. Real neighborly stuff! 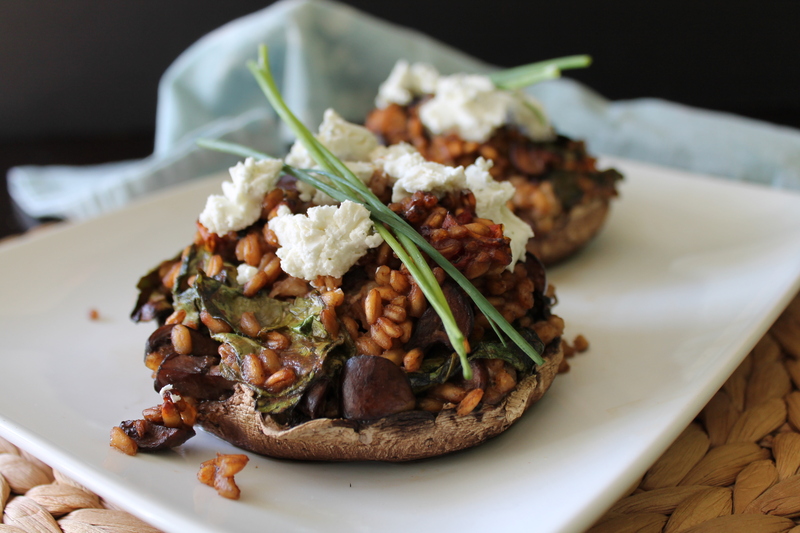 My friend Sarah from Well Dined decided to help me use up some of this farro (guys, there’s like two pounds…good thing I like grain salads), and we got very excited about roasting up some mushrooms, stuffing them inside of more mushrooms, and topping it off with our very favorite: goat cheese. 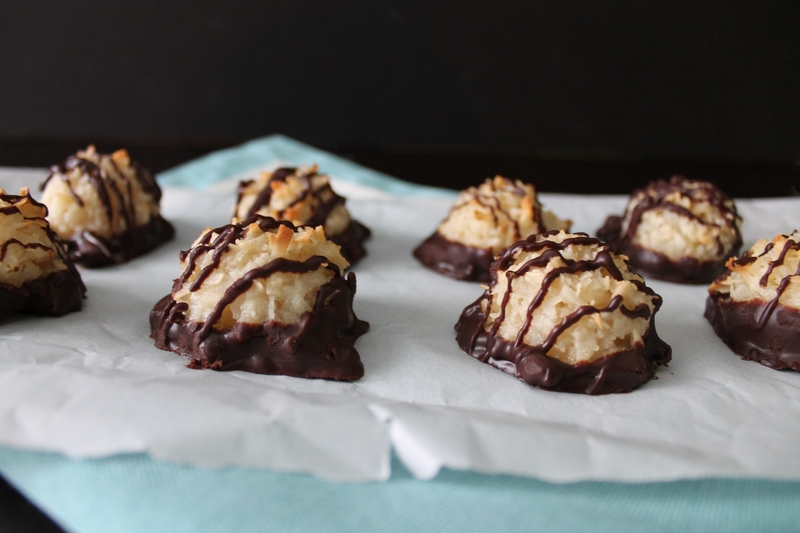 What is there to say about coconut macaroons? This was a cookie I feared/didn’t understand as a child. (But really, anything that wasn’t a gooey chocolate chip cookie just seemed inferior when I was 10.) Thank goodness my tastes have grown up, because coconut? It’s awesome. Normally when I have extra egg whites lying around, I make French macarons. But honestly, sometimes I just don’t have the energy to make cookies that take hours of effort and leave a pile of dirty dishes in their wake. The answer, obviously, is coconut macaroons! 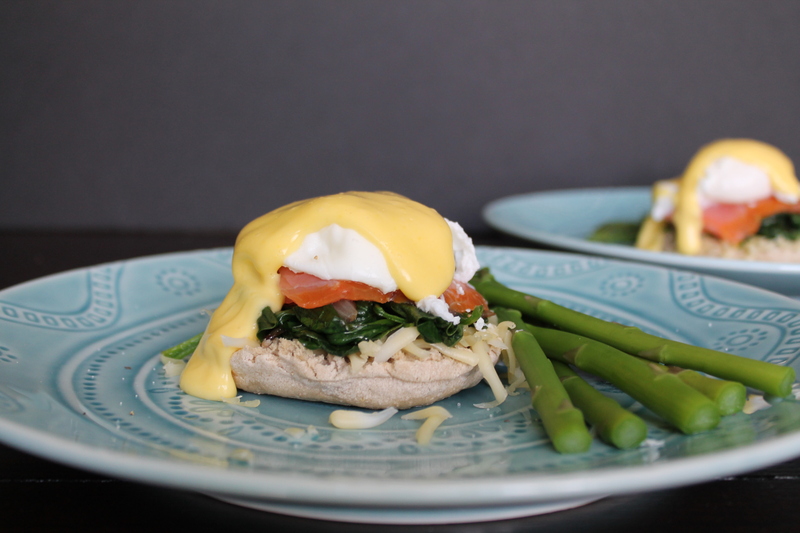 Delicious and simple from start to finish! A few weeks ago, I started doing the Cooking Cure challenge by the Kitchn. I didn’t actually make it very far, because the more I thought about it, the more I realized that my main problem was breakfast. I mean, I regularly make delicious and daring lunches with Sarah of Well Dined. And dinner at our house is a constant revolution of new recipes so that I will be able to share new ideas with you! But…until the beginning of the year, I could probably count on one hand the number of times I ate something other than Frosted Mini Wheats for breakfast since I was 21. Yep, long time. So instead of moving on to lunch or dinner, I stuck with revamping my breakfast plan. And this meal was hearty and bright and delicious! 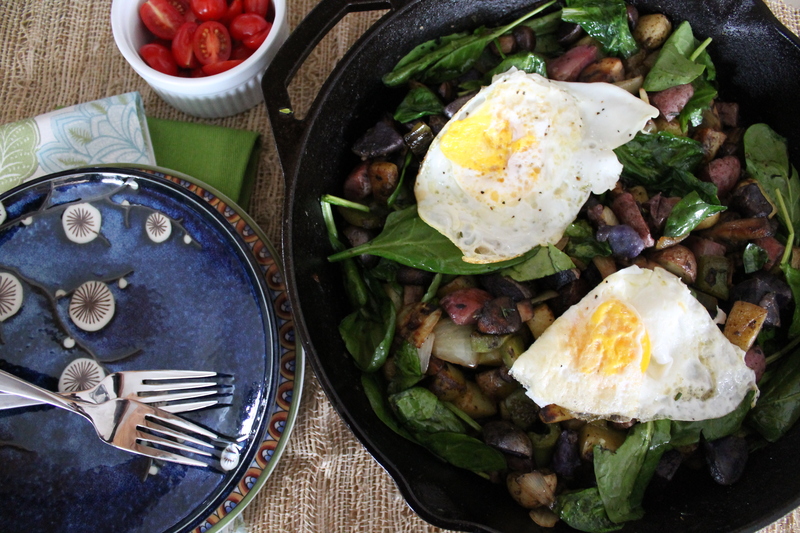 Bright, jewel potatoes full of antioxidants and potassium, flavorful veggies like spinach and mushrooms, topped off with a beautiful, yolky egg? Yes, please! This year I got to host my mom’s birthday celebration again. Of course, the most important part of any real birthday celebration is the cake. But the meal is also a big deal, especially for someone who can’t eat dairy or wheat but still wants to share something special. My mom pretty much gives me free reign to try new foods when she comes to visit, but for this particular meal with all its importance, I was just stumped. 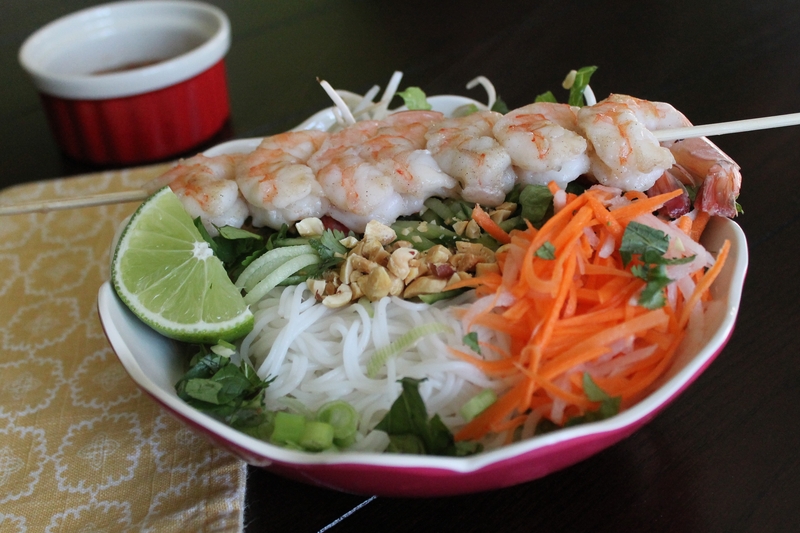 Then, my darling husband suggested Vietnamese, and I instantly conjured up a mental mouthful of rice noodles, grilled shrimp, and crushed peanuts, accented by a mouthwatering sour-spicy sauce. So we had noodle bowls. And they were delicious! You should have noodle bowls, too. This is like a great, big, noodle salad. It involves very little cooking (except, of course, the shrimp and the noodles), and you can serve everything warm or cold, which is perfect for unpredictable situations like having company! And, bonus, each eater can customize their bowl to their liking. A perfect, simple meal for guests! You know what’s really easy to make? Pickles. The first time I ever encountered non-cucumber pickles was a revelation to me. I have always hated cucumbers, and pickles were naturally distasteful to me, as well. But there I sat, across the table from the man I would one day marry, sweaty and gross after the first of many 3-mile runs, getting ready to eat pho. Or rather, I should say, that he was getting ready to eat pho, and I had opted for something less warm, because I didn’t think I could handle a pot of heavy broth at that precise moment. So there we are, me feeling super awkward because of the sweat now drying on my clothes, my calves already tightening from the run (in which, naturally, I had pushed myself too hard in order to impress this strange man), and him chatting merrily about pho broth. And I found this weird little dish of condiments in the middle of the table. 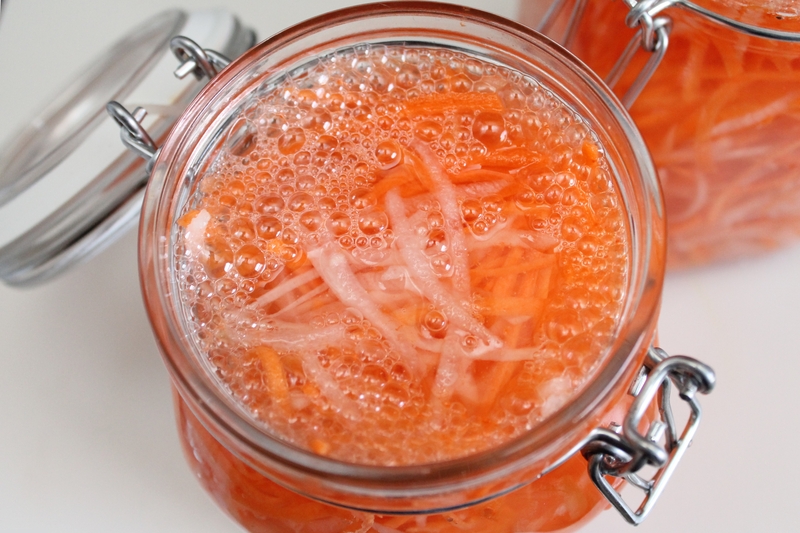 And there were pickled carrots and daikon radishes. And I had no idea what a daikon radish was. And…I totally thought they tasted weird. You guys, I have had it all wrong! For years, ever since first setting eyes on rugelach on my honeymoon in Germany, I believed that these cookies were always stuffed with dried fruits or poppyseeds. 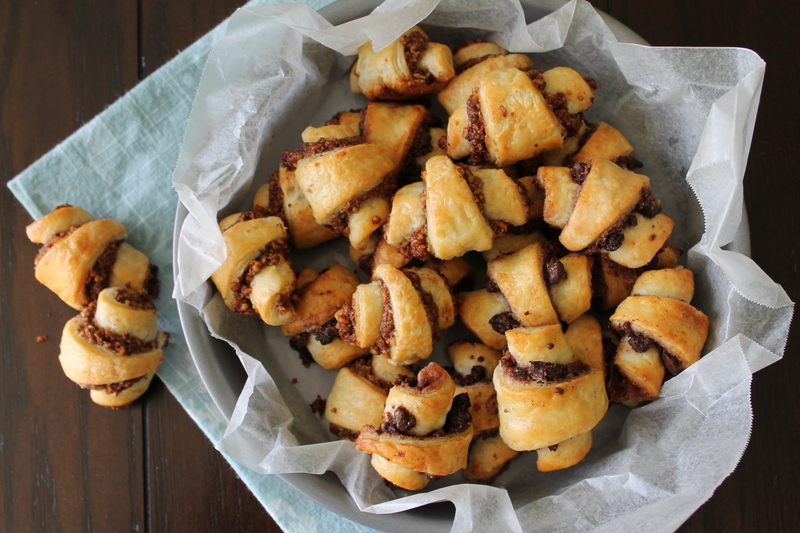 Apparently…rugelach can be chocolate! Or nutty! Or, really, any flavor you please. So, many thanks to C Mom Cook, my Secret Recipe Club blog of the month, for showing me the truth of these amazing cookies. 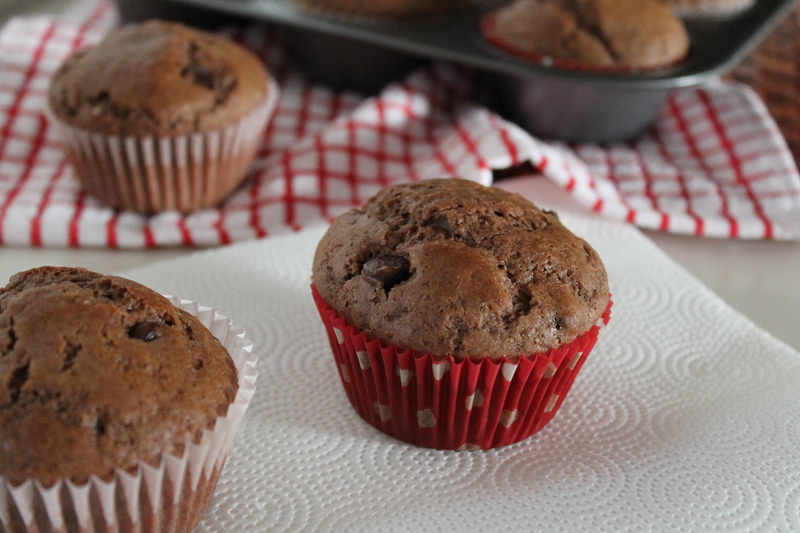 I so enjoyed Shelley’s blog, in part because she is a Daring Baker! I was very briefly a Daring Baker until it became clear to me that I didn’t have enough time to be quite so daring. But Shelley is baking up beautiful breads and cakes and pastries, which I just love reading about and drooling over. Rugelach are a traditional Jewish cookie that look impressively like filled croissants. They require a small amount of persistence, but are actually quite simple to make! I filled half of mine with a chocolate-cinnamon-date mixture (to die for) and the other half with a honey-nut mixture (almost like baklava). And then I couldn’t stop eating them. So delicious! Thank you for introducing me to the number π. And thank you for letting me convert that number into a reason to eat dessert (as if I needed another excuse). That’s right! It’s 3/14 again, Pi(e) Day! I really struggled in trying to decide what kind of pie to make this year. Ever since last year, I have been planning to make French silk…but honestly, I am still a little overwhelmed by chocolate after the month of February. In fact, I seriously contemplated making a savory pie or tart (Sarah didn’t even hesitate) and skipping dessert altogether! But then I just couldn’t do that to Pie Day. 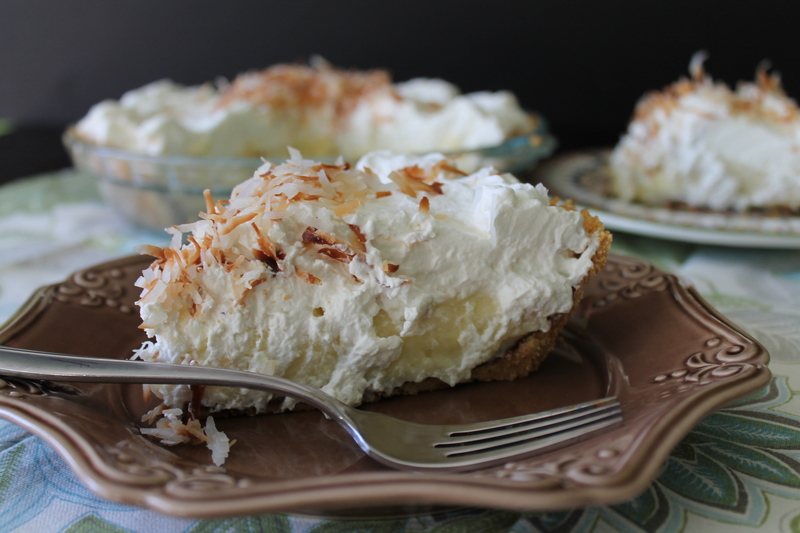 So I made you a fabulous coconut cream pie. Since I don’t eat meat, I struggled a bit with figuring out how to celebrate Ireland on the blog. I really wanted to make soda bread, but Dave’s idea of soda bread is dry and unpalatable. I decided to go for it anyway, just to prove him wrong. So here we are. I searched the interwebs for a recipe that would impress him. I considered white or dark bread, dried fruits or plain, seeds or no seeds…I even pondered totally untraditional offerings, such as minced herbs and browned butter. Then it suddenly occurred to me that I have a fantastic cookbook by a revered Irish chef, Darina Allen (and thanks to my brother-in-law, for giving it)! 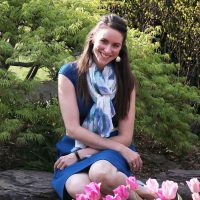 She is all about history and tradition, but at the same time she is willing to update the classics to reflect modern access and changing tastes. 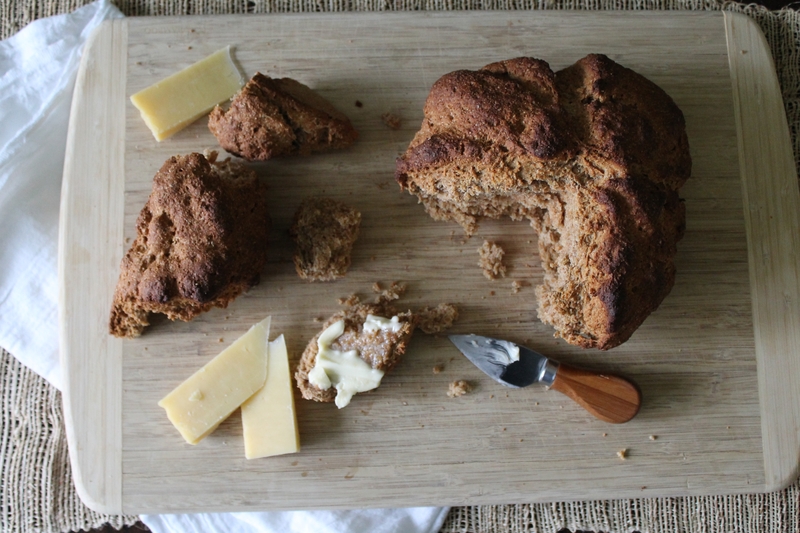 I figured that her recipe for soda bread was the best place to start!